This member of the finch family might possibly be mistaken for a Greenfinch, except for the fact that the Siskin is smaller and has such a distinctive pair of yellow bars on each wing. The Siskin pictured here is a male, with the almost black crown and small patch under the chin; the female is not so bright and is noticeably brown-striped on the head and under the chin. 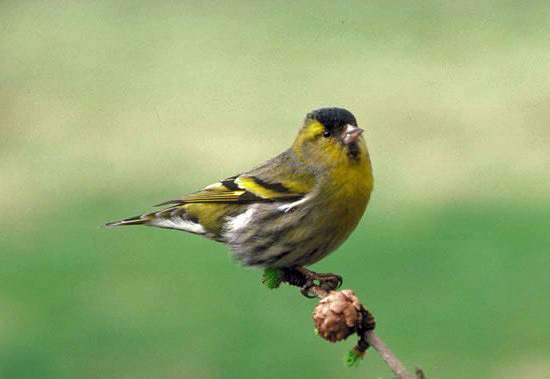 Many Siskins are winter visitors; however, there is also a resident population, particularly in the north of Britain. They generally nest in fir trees, building from twigs, grass, moss, hair, feathers and wool. The four or five eggs in a clutch, laid in April, May or June, are bluish-white with lilac and brown spots. Siskins eat seeds and small insects, and they will readily come to bird tables in quiet gardens.